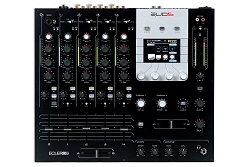 The Ecler EVO 5 is the perfect tool for today’s DJs and producers thanks to its unique combination of a state of the art internal 12 channel FireWire sound card, the highest digital sound quality ay 24bits/96kHz, felxible MIDI control and the most powerful built-in editable effects processor available in the marketplace. The Ecler EVO 5 features the best digital components in the market. The external analogue signal is digitalised through a professional A/D converter at 24bit/96kHz for the highest sound quality. A background of more than 40 years designing and manufacturing professional audio products make our circuits extremely efficient with regard to signal processing and routing. They are designed in order to get the most resemblant analogue audio quality and all of them are engineered, mounted and fully tested in our factory in Barcelona, Spain. 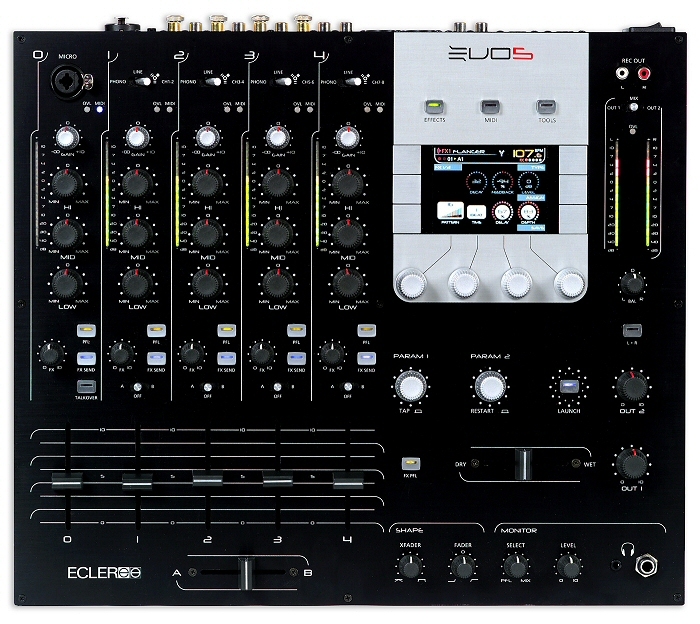 The Ecler EVO 5 allows professional DJs to think forward and integrate software in their set up thanks to its top quality 24bit/96kHz internal sound card. 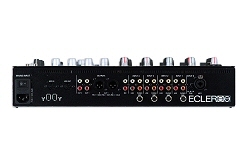 This top of the range sound card features 12 mono input channels (6 stereo inputs CH1, CH2, CH3, CH4, MIX and PFL) and 12 mono output channels (6 stereo outputs CH1, CH2, CH3, CH4, MIX and CH0). Stereo outputs can be used for instance to route Phono or Line inputs to a computer for effects processing with your favourite software or to record your set in your computer. This compact sound card is powered via FireWire, a professional standard superior to USB, and it transfers all audio channels and MIDI information through only one FireWire cable. This powerful tool turns the EVO 5 into the perfect console for music production and live performances. The EVO 5 features a powerful effects processor at 24bit/96kHz that can be fully edited. It features 8 basic effects: Delay/Echo, Filter, Flanger, Phaser, Transformer, Panoramic, Pitch and Reverb, and all effects parameters can be edited. Moreover the EVO 5 offers the new and revolutionary possibility to chain 2 basic effects and so create complex customized effects. A total of 64 different complex effects can be created, named and saved. A precise BPM counter with reliability indication synchronises the effects. Another new feature is the synchronisation by pattern that allows controlling the effects in an extremely creative way. There are also 2 dedicated Microphone effects: Noise Gate and Compressor (also editable). Personal effects presets can be imported and exported using a computer via FireWire with the EVO5 external software (included). The 69 controls of the EVO 5 are MIDI enabled and completely mappable and editable. Moreover the EVO 5 features a dedicated MIDI control section with 10 push switches and 4 rotary encoders around a full colour screen, which turns into the perfect display for labelling the controls functions. There are 64 different layouts including different control presets for DJ software such as Traktor and Live. Presets can be imported and exported using a computer via FireWire with the EVO5 external software (included). There is also a MIDI Clock output synchronised to the BPM counter. All MIDI information is transferred with ultra low latency thanks to the EVO 5 FireWire and MIDI DIN5 interface. 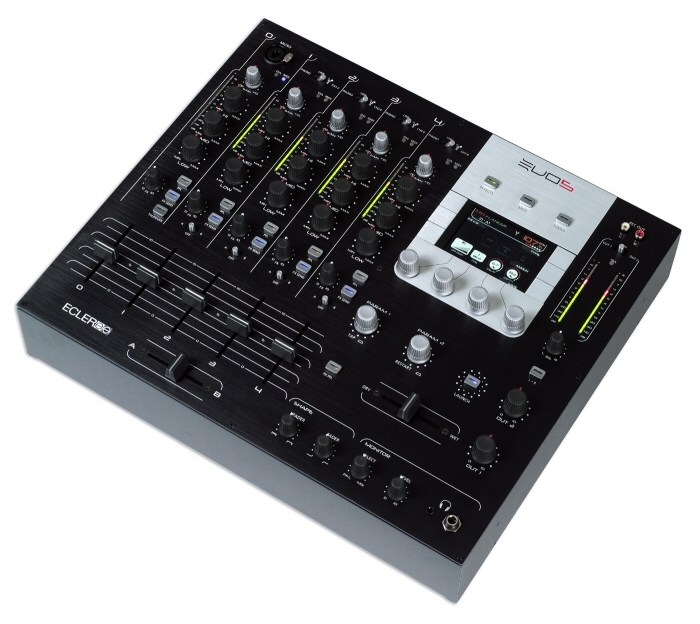 The EVO 5 includes a 3,5 inch screen to enhance your creativity and gain total control of your mixer parameters. Thanks to this high quality colour resolution screen, users can easily display labels for MIDI controls, edit sound effects and mixer parameters. The screen also serves as a display for the BPM counter, the MIDI monitor, the FireWire connection and much more. The EVO 5 software can be updated and the mixer features can be upgraded, for instance storing new sound effects. 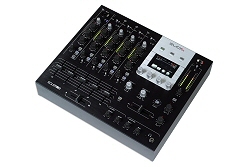 Updates and upgrades are easily done using a computer and the mixer is fully compatible with Macintosh computers. Most EVO5 parameters can be easily adjusted through the screen. Users can choose between Kill and Baxandall EQ styles. EQ gains and frequencies are fully editable and channel EQ can be also bypassed. Microphone Talkover and dedicated effects are also editable. On the output, users can adjust sensibility of OUT1 and OUT2 to 0dB, +3dB or +6dB, as well as assigning the REC signal to MIX or PFL. All fader shapes can be adjusted, including the crossfader, the channel faders and the effects Dry/Wet crossfader. The BPM counter can be assigned to the internal source or to the MIDI Clock, and can work on different ranges from 60 to 220 BPM. The FireWire sound card input and output levels can also be adjusted from 0dB to +18dB. Different user presets protected with password can be saved, as well as imported and exported using a computer with the external software (included). The EVO5 features a limiter on output 1 or 2 for a totally safe performance. The limiter is only accessible with a special password in order to avoid that a non authorised user modifies it. The limiter can be assigned to OUT1 or OUT2, or it can be deactivated. The limit threshold goes from -20dB to +6dB. Club owners and sound engineers can feel safe thanks to this unique feature that will prevent the sound system from any damage.